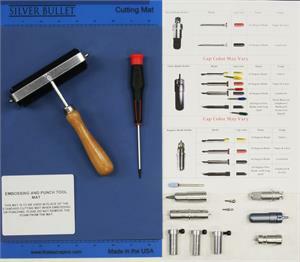 Got to Have it All PACKAGE DEAL for Silver Bullet cutters. Request from our customer base, most people want to have everything handy to try it all when they get their machine. We will also be including a brayer which is very important for helping adhere media to the mat and a metric screw driver for changing the grub screws in your tools. The retail value of this package is $355.00 and will be reduced to $299.00 with the purchase of a machine. This kit will be placed inside the machine box at the time of shipping. We hope you take advantage of this great offer! Be sure to check out the acrylic tables (sold separately) to complete the package. The tables are important to keep the mat flat as it is rolling in and out of the machine. The acrylic tables are not necessary if you are planning to cut only vinyl.